Can you imagine sharing this planet with another species of human? Let’s say with the Neanderthal man. The two of us might occupy entirely different hemispheres or continents (allopatry). Alternatively, we may co-exist in close proximity, side by side in every country, city, town and village (pure sympatry). Intermediately, we might have some habitats just for us, and others, just for them, peppered with a few shared habitats where we “mix” (mosaic sympatry). If there were another species of human on the planet, what would they be like? Would they look like us? How would they differ? Would we continue to evolve separately as different species? Or would some members of our species (or theirs) cross the species boundary one day and start hybridising? Perhaps the most intriguing question of all is, when and why did the split between our species and theirs (speciation) take place? These are the types of questions that fill the mind of an evolutionary biologist – a never-ending suite of uncertainties and intrigues. We closely scrutinise detail after detail looking for clues that might answer these questions and more. As scientists, we can learn many things from studying the appearance, distribution and behaviour of a species in the field. These days, however, answering these questions invariably forces us into the lab, where we can delve deeper into the complex world of DNA. Over the last decade, our team of scientists have been investigating such questions about manta rays. One piece of the puzzle at a time, and using an ever-expanding array of techniques to help us along, we are unravelling the mystery behind the evolution of the world’s largest ray. The classification of the genus manta has been notably convoluted, with the group having as many as 25 different species names over time. 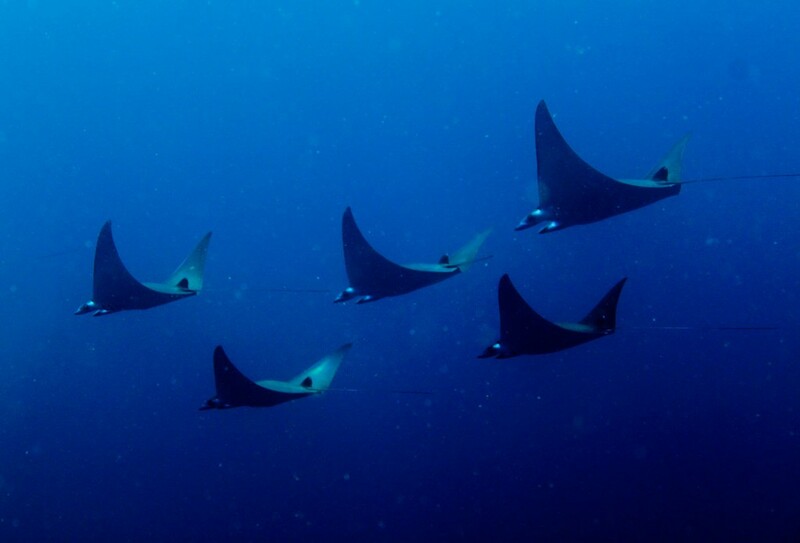 These numbers are not surprising given the unique appearance of manta rays and their impressive size, both of which prompted many early ocean explorers to lodge reports of their encounters with this giant ray. However, the rarity of adequate specimens in collections or the accessibility of those from fisheries stymied early taxonomic efforts to accurately describe manta rays. Today, these same problems continue to thwart efforts to clarify taxonomic issues within this genus, leaving many of us frustrated yet challenged. Having previously been considered a monotypic genus, with a single recognised species, our ground-breaking study in 2009 split the genus manta into two visually distinguishable species, Manta alfredi, the reef manta, and Manta birostris, the giant manta. It is not often that the world recognises the existence of such a large previously-unrecognised giant! How were these species different and what drove them to speciate in the first place? Since their separation, we have learned that both species have wide distributions around the globe and share the world’s oceans in mosaic sympatry. For example, only the giant manta ray has been sighted in the eastern Pacific Ocean, in locations such as Mexico, Costa Rica and Ecuador. 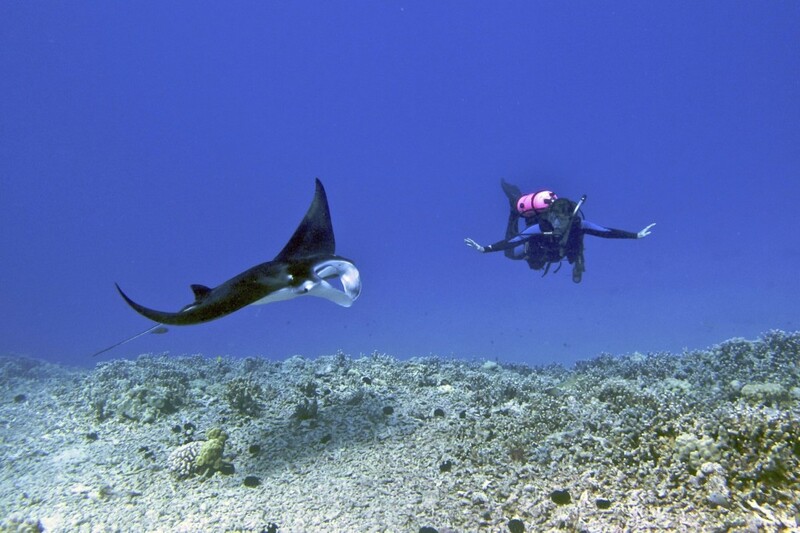 In other areas, like along the eastern coast of Australia, only the reef manta ray are seen. While habitat occupancy by the two species in the Philippines or Indonesia are quite intermingled, it is only along the eastern coast of southern Africa, most notably Mozambique, that both species are regularly encountered on the same dive. It also appears that the two species have very different habits. Over the past decade we have determined that the reef manta typically has a smaller, more distinct home range and prefers warmer, stable conditions whereas the giant manta is a bit of an ocean nomad, travelling across international borders and into high seas. This fact could have played a significant role in their initial speciation from one another and their subsequent population of different regions across the world. The initial separation of the two species of manta was based on morphometric measurements and external characters including colouration, teeth, denticle and spine morphology, as well as size at adulthood and maximum size. In most cases, DNA studies tend to strengthen and add depth to more traditional studies, so we were eager to see what genetic analysis would reveal to us. For our purposes, DNA analyses involve extracting tiny bits of muscle tissue with an underwater biopsy. Our team has amassed the largest tissue database in the world for manta with samples from most of the word’s major oceans and each of the continents within their respective distributions. In the lab, DNA is extracted with an established protocol. Then, chosen genes from nuclear DNA and mitochondrial DNA are amplified to millions of copies by a procedure called PCR. Nuclear DNA is inherited bi-parently, while mitochondrial DNA is inherited maternally (only from the mother). Thus we can analyse both types of genetic signals. Amplified PCR products go through sequencing reactions, which enable us finally to read the sequence of DNA at molecule level, e.g. “G, G, C, A, T, T, C, G, T, A, G, C, (nucleotide names abbreviated to letters)”. Data acquired in such way are then analysed with all sorts of techniques and the results interpreted. In essence, it is expected that DNA profiles of the same species of the same population are much more similar than the ones in distant populations. Similarly, DNA profiles of different species in the same region differ even more than the ones from the same species in distant locations. Our DNA analyses supported that reef manta ray and giant manta ray are genetically distinct and separate species. Interestingly, we discovered that their origins are however very recent. In fact, the timing is not much older than the split of us humans and Neanderthal man. The difference is that the Neanderthal went extinct. In the case of manta rays, both species of manta ray survived the Pleistocene ice age cycles and are still in existence. While the origin and timing of speciation events is still a hotly debated topic, even in the most extensively studied species (i.e. us, Homo sapiens), we can say that we have established an important yard stick for understanding when these species began their journeys along these separate paths. As to the question of why they speciated when they did and how they have evolved since the split, well, there are still some mysteries that need unravelling! Besides these questions at species’ level, DNA analyses can also tell us a lot about population level questions. These include population connectivity such as degree of migration among populations and population size and their genetic health. These studies will become important in coming years. To add to the intrigue, one of our recent taxonomic studies of manta suggest the presence of a third, potential species, referred to as Manta sp. cf. birostris, after specimens in the Atlantic turned out to be distinctly different from both recognised species. Our team has launched a full-blown study and the findings of this study are due out later this year or in 2013. Ultimately, the recent scrutiny of the genus manta and the efforts to accurately separate out all of the species within it, continues to provide researchers and the public with aids to properly differentiate these species in the wild. This work has also proven timely for conservation, by allowing scientists to highlight the specific, and often very different threats (e.g., targeted fishing, bycatch fisheries, boat strikes and habitat degradation) facing the different species and populations of manta across the globe. In recent years, this has culminated in the elevation of both species of manta to vulnerable status on the IUCN red list and the listing of the giant manta as a vulnerable migratory species on the Convention of Migratory Species Act (CMS). As is often the case, the more we understand about species, the easier it becomes to protect them. Dr Andrea Marshall was the first person in the world to complete a PhD on manta rays. After completing her thesis in 2008, Andrea stayed on in Mozambique to spearhead the conservation efforts of this species along this remote coastline. Shortly after she, along with other members of her team, founded the Marine Megafauna Association, which grew into the now widely known Marine Megafauna Foundation. Her passionate commitment to the eastern African coast has shaped her goals as a conservation biologist. Vowing to dedicate her life to the preservation and management of the manta ray population in southern Mozambique, Andrea continues to campaign for their protection and use her scientific background to formulate plans for their management. Tom Kashiwagi is a geneticist and PADI Divemaster who works on a population of manta rays in Japan as well as Dr Andrea Marshall’s geneticist on her various global projects. Tom is finishing up his PhD at the University of Queensland.